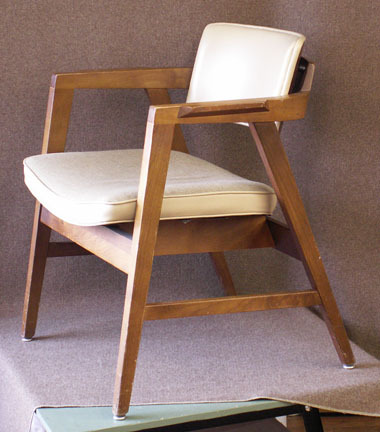 Here’s a beautiful example of a 1978 Gunlocke chair we recently acquired – the wood is solid walnut and the upholstery is in good shape. William Henry Gunlocke entered the chair business in Binghamton in 1888 as a wood finisher and rose to the position of factory superintendent. He and four other men came to the village of Wayland in western New York in 1902 in response to a newspaper advertisement placed by the civic fathers seeking to fill a vacant factory building. The W.H. Gunlocke Chair Co. began production there with less than a dozen employees. Gunlocke’s reputation for quality designs and craftsmanship was due in part to its extensive use of steambending. By 1912 an entire department had been devoted to this time-honored but exacting process, which had been abandoned by many manufacturers in favor of less costly bandsawing. Gunlocke’s practice was to air-dry wood for six months to one year before using it. This process, plus kiln drying, was essential to producing the company’s durable furniture, including seating made to last for decades. Although the company’s furniture was initially designed, manufactured, and merchandised primarily for household applications, it found a growing market in business settings and began to specialize in furniture for business and government offices, as well as for the nation’s schools. Woodrow Wilson became the first of a long line of presidents to use one of its chairs. In 1972, Gunlocke added a full line of high-quality library furniture. In 1973 it had showrooms in Los Angeles, New York City, and Dallas, as well as Chicago. Its product line in 1974, aside from seating, desks, credenzas, and library furniture, included conference and side tables. These products were made primarily from solid walnut, maple, and white oak, as well as veneers of these woods. In 1977 Gunlocke introduced a new desk series and three chair styles by leading designers. I plan on fixing it and selling later. Seat cushion is filthy and needs lots of TLC (and Febreeze.) I’ll clean and stain/wax the wood frame. I’m interested in purchasing it. No need to repair or clean. I’m not sure if you got Devin’s recent comment (it wasn’t directly under your comment thread) – says he has this Gunlocke chair in green upholstery. See below your comment on the page to reply to him, if you’re still interested in purchasing. Nice find – they are awesome chairs! Super comfort, and classy. I just got one at an action at work for 6.00 it is the best, I need however to have it recovered, I don’t like the material color. I have this exact chair although the leather and upholstery are green. I’m thinking of selling it and was wondering what these will go for. Your comment appeared down the page from Colleen’s – I posted a direct reply to her in case she didn’t see it. Hope this helps you both. Hi, Is this thread about gunlocke chairs still active? I just aquired a set, and was wondering if it would be better to refinish. The set I’ve got is in excellent condition. The finish however is a shiny clear coat. I saw one of the re-finished sets photos, and the wood looked flat or satin. Seems more desirable to me. What do you think? These have an excellent finish, with only a couple minor dings that one would expect with chairs this age. I rreally like the look of those pictured here. What do you all think. Mine also have royal blue upolstry excellent condition. Wow, Stephani – sounds like you have some beautiful chairs! I prefer a satin finish as well, but have not actually seen the glossy finish on this particular chair. A purist would probably advise keeping the original finish since these chairs are becoming collectors items. However, the answer really boils down to your preference: what are you willing to live with, and if you decide to refinish what would it take to do the job right? You might consult an appraiser or antique furniture expert if you are concerned about the potential value.